In addition to the other security checks, customs officers may weigh and inspect all outgoing baggage. Departing travellers are therefore required to identify their baggage for inspection by the custom officers. Airport departure tax is included on your airline ticket. Items you purchase for business promotional and commercial purposes will be taxable on return. All electronics bought on your trip (mobile phones, tablets, game stations, laptops, computers, stereos, televisions, projectors, video recorders, microwaves, cookers, ...). Any items bought for someone else. Items bought at duty free shops that exceed the allowable limits. Currency exceeding US$10.000 or its equivalent MUST be declared at customs before departure. Hunting and trafficking in game trophies is banned in Kenya. Export of live animals, birds and reptiles is also banned except by a licensed professional dealer with special permission from the Director of Kenya Wildlife Services (click here). • Items you are taking for repair or alteration. • Tool box(es) you require for repair work abroad and you intend to bring it back. •	Cameras and accessories for filming outside the country. Obscene photography is forbidden. It is an offense to photograph the National flag, the President, state lodges, soldiers, prisons and convicts and military barracks. Items you purchased and are carrying with you upon return to Kenya. Items you inherited while abroad. Items you bought in duty-free shops, on the ship, or on the plane beyond the allowed limits. Items you brought home for someone else including gifts. Items you intend to sell or use in your business, including business merchandise that you took out of the Kenya on your trip. Currency above US$10,000 or its equivalent MUST be declared at customs upon arrival. You must state on the Passenger declaration form, in $US, what you actually paid for each item. The price must include all taxes. If you don’t know for sure, estimate. If you did not buy the item yourself - for example, if it is a gift - estimate its fair retail value in the country where you received it. 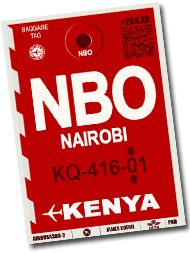 Kenya Revenue Authority (KRA) has set maximum duty collected on personal effects at KHS 50,000 (US$ 500) in its latest bid to speed up clearance of passengers at the international airports. Remember: even if you used the item you bought on your trip, it’s still dutiable. You must declare the item at the price you paid or, if it was a gift, at its fair market value. Complete list of prohibited items: click here. Firearms and ammunition cannot be imported without an import certificate from the Central Firearms Bureau (PO Box 30263, Nairobi, Kenya). Complete list of restricted items: click here. Household effects conditionally included are duty-free. These include such items as carpets, paintings, tableware, linens, and similar household furnishings; tools of the trade, professional books, implements, and instruments. For Customs purposes, clothing, jewelry, photography equipment, portable radios are considered personal effects but cannot be brought in duty-free as household effects. However, duty is usually waived on personal effects more than one year of age. Consumables in small amounts of 1 liter of alcohol, a 250cl of perfume, 50 cigars, 200 cigarettes or 250g of tobacco are allowed duty free. Donations into the country are taxable unless exemptions are sought and can produce a Pro 1B or exemption letter from the ministry of National Treasury. Donations for medicines and medicaments need to be cleared by the Pharmacy and Poisons Board before entry into the country. Items that are brought in as temporary importation for repair need to be declared in a C510 document before the goods enter the country. Goods for exhibition and return in an unaltered state need to entered in a C500 document before the goods enter the country this includes goods for exhibition, gowns for fashion shows, artwork etc. a) Undertake to export the equipment within such period not exceeding twelve months from the date of importation. However this period may be extended on application to the Minister for Finance through the Commissioner.